TLAMANALCO, Mexico, Aug 18 2018 (IPS) - One of the fears of the people of the Sierra Huasteca mountains in the state of San Luis Potosi in northeast Mexico is the construction of combined cycle power plants, which would threaten the availability of water. “We have heard rumours about the installation of two more plants, but we have no information. They operate with very obscure mechanisms,” said Esther Peña, an advisor to the non-governmental Coordinator of Peasant and Indigenous Organisations of Huasteca Potosina, which was founded in 1994 and which brings together 12 organisations of indigenous people and small farmers in six municipalities. Peña told IPS that the Tamazunchale combined cycle plant, which has been operating since 2007 with a capacity of 1,187 megawatts (MW), is polluting the environment and damaging coffee and citrus plantations, as well as cattle ranching. The Spanish company Iberdrola, which owns the plant, plans to build two additional plants, Tamazunchale I and II, with a total capacity of 1,187 MW, which are still in the design phase. The expansion of these natural gas-fired thermal power plants, whose waste gases are reused to produce more energy from steam, is a concern for defenders of water and enemies of fossil fuels because of the social and environmental impacts. The threats identified by these groups also include the extraction of unconventional hydrocarbons from shale and the use of water by mining companies, soft drink and brewery plants, and other industries. During the National Workshop of Promoters of Water and Basin Councils, 121 representatives from 51 Mexican organisations analysed how to redress the impact of these activities on access to water, as well as how to promote solutions that put water management in the hands of citizens. The emphasis of this vision is on community management of water, the human right to water access, the care of water and water quality, as laid out in the proposed General Water Law, drafted since 2014 by civil society organisations, academics, local communities and indigenous peoples. The organisations elected representatives from 28 basin councils, who will carry out the local work of disseminating the citizens’ initiative and mobilising support. From this perspective, the link between water and energy becomes relevant, above and beyond the construction and modernisation of hydroelectric power plants and amidst the impacts of climate change caused by the extraction and burning of fossil fuels. “Today, the vision of using water to produce energy, such as in hydropower plants, combined cycle power plants and natural gas, has taken hold. 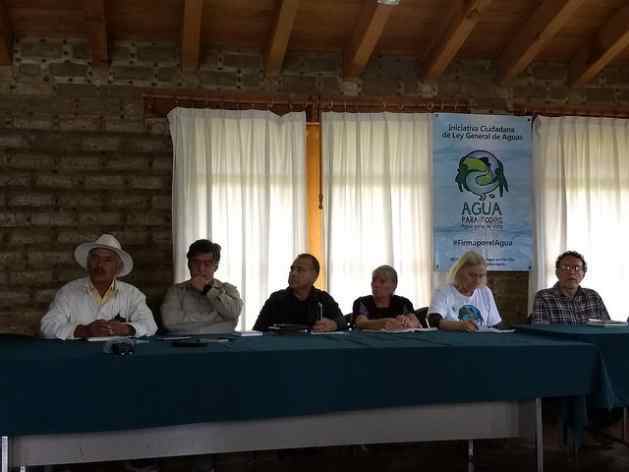 Water is being misused,” said Óscar Monroy, president of the non-governmental Amecameca and La Compañía River Basin Commission. 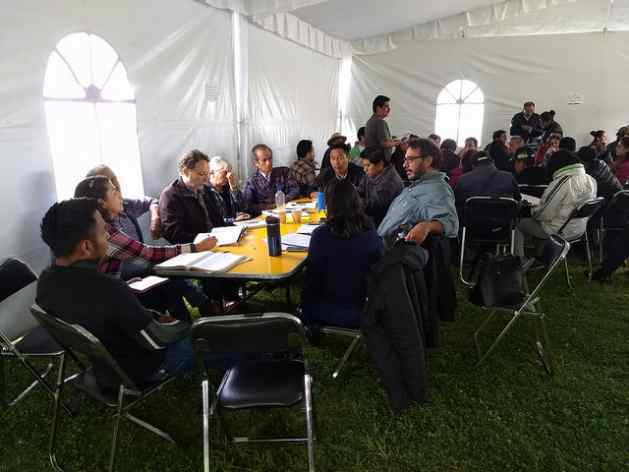 Monroy was one of the participants in the meeting in Tlalmanalco – which means “place of flat land” in the Nahuatl language – a city of 47,000 people about 50 km southeast of Mexico City. Encouraged by the importation of natural gas from the United States, the state-owned Federal Electricity Commission (CFE) and private companies are working on the assembly of combined cycle power plants, favoured by the opening of the energy sector to private capital in 2014. The 2017 report “Neoliberal threat to common goods: national outlook for electricity megaprojects,” prepared by the non-governmental company Geocomunes, indicates that the CFE currently operates at least 27 thermoelectric, combined cycle and turbo-gas power plants, while there are at least 22 others in private hands. Another 16 plants of this type are currently in the project stage and the CFE is building at least six additional plants that will come into operation in the coming years, according to data from the state agency. In the second electricity auction, in September 2016, the Mexican government awarded a CFE combined cycle project in the northern state of Sonora and another private project along the border with the United States, in the northeastern state of Tamaulipas, while in the 2017 electricity auction, two other private facilities were awarded. By 2017, the autonomous public Energy Regulatory Commission had granted 645 permits for fossil fuel power generation – including combined cycle thermoelectric plants – equivalent to half of the authorised total. In the first quarter of 2018, combined cycle plants, whose consumption of water for driving steam turbines is unknown, contributed 30,920 MW of the national total of 75,570 MW. Several studies predict a water crisis in Mexico by 2040, especially from the centre to the north of the country. Of the 653 national aquifers, 105 are overexploited. Data from Oxfam Mexico indicate that almost 10 million people, out of the 130 million who live in this country, lack water in their homes, so that using water for generating energy conflicts with these needs. The last straw for critics was the decision by the government of conservative Enrique Peña Nieto in June to lift the ban on water in 10 of the country’s watersheds to encourage its use for electricity generation, manufacturing, mining, brewing and other industrial uses, which would leave some 51 billion litres of water under concession for 50 years. In response, communities of indigenous peoples and non-governmental organisations filed 36 applications for a writ of amparo – an action brought to enforce constitutional rights – against the decision: 12 were accepted by the courts, 12 were rejected and 12 are still pending. In Tamaulipas, “we face the threat of energy projects,” such as hydraulic fracturing, said Ricardo Cruz, a member of that state’s Association of Environmental Lawyers. This technique, also known as “fracking,” releases large volumes of oil or gas from deep rock by injecting massive amounts of water and chemical additives that pollute the air and water, according to environmentalists. “We are very alarmed, because it could have a negative impact on health, agriculture and livestock farming,” Cruz told IPS. For those who attended the workshop, the solution lies in the approval of the citizen-initiated bill on water. To comply with the constitutional reform of 2012 that guarantees the human right of appeal, the government was supposed to endorse new legislation in 2013, a deadline it failed to meet. Therefore, its promoters will present the initiative next September, when the next Congress, elected in July, begins its session. “The solution to the megaprojects is the citizen law, because it stipulates that water cannot be used for these megaprojects,” said Peña, in whose region people complain that the state-owned Petróleos Mexicanos oil giant intends to exploit gas with fracking, at the expense of people in at least 12 municipalities. The 2016 report “Territorialisation of energy reform: control of energy exploitation, transport and energy transformation in northeastern Mexico,” by Geocomunes, says the construction of combined cycle plants “weakens the traditional main activity, agriculture,” in San Luis Potosi. The citizens’ initiative promotes the elimination of the state-owned National Water Commission and its replacement by a National Water Council made up of Regional Basin Councils. In addition, it creates the Office for the Defence of Water, which has the power to punish anyone who wastes or pollutes water, or uses the resource for agricultural and environmental activities. “A balance is needed for there to be water for all. Other types of projects are possible, with citizen organisations,” Monroy said. Cruz concurred with Monroy, saying that “it is important to prioritise and water is not for profit. The goal must be to protect the human right” to water, he said.